An early illustration depicting the - Californian inspired - resort pool's artificial beach. To download Saltdean Lido's comprehensive history document, 'Temple to the Sun', please click the image. A functional and stylised building, Saltdean Lido is considered to be the apogee of lido design, epitomising some of the best elements of the modernist movement. It is regarded by many critics as one of the best surviving examples of lido design in the UK. It has been named by English Heritage as one of the Seven Wonders of The English Seaside and is also listed on the organisation's ‘Buildings at Risk’ Register. Along with its sister modernist building, the Ocean Hotel, the lido was designed to be the centrepiece of Saltdean’s seafront. It was created to elevate Saltdean’s status as a fashionable resort in the competitive 1930s British holiday industry. Just as the Victorians, 60 years previously, had considered a pier to be an essential element of a seaside resort, by the 1930s, lidos had become an important status symbol for successful resorts. Sited at the centre of Saltdean’s seafront and bordering its main coast road, the lido has always been highly visible and is intrinsically linked to people’s primary image of Saltdean. The building is deeply rooted in Saltdean’s identity and remains a symbol of its heritage. Heritage highlights within the complex include the crescent shaped water tank / pool with its reinstated art deco fountain. Surrounded by sunbathing lawns, it can accommodate 500 bathers. Original features of note are the distinctive curvilinear changing rooms and sunbathing decks, which flank either side of the central rotunda. The building façade is reminiscent of the bow of a ship (typical of the streamlined modernist style) and uses load bearing techniques developed in this period to give the design lightness in appearance. In addition to its architectural merit, Saltdean Lido is valued for its social and economic history. Nationally it is indicative of the lido movement’s success and connotes the aspirations of modernist Britain. Locally it tells the story of modern Saltdean and the community who used it. In terms of its social history, the lido has had many different uses during its 79-year history. Opened in May 1938, with the admission of sixpence, holidaymakers and residents flocked to experience its modern amenities which included: warmed and purified water delivered by its cascade fountain; a three-tiered diving board; purpose-built beach with ‘real seashore sand’ – and its sunbathing lawns. Its first floor ballroom/café space became the perfect venue for dances, whilst exterior speakers played the latest hits of the day to swimmers and sun-worshippers in the grounds. There was also an American inspired soda fountain which complimented the ‘New Hollywood’ inspired façade. After its May 1938 opening, Saltdean Lido enjoyed just three summer seasons before ‘The Battle of Britain’ forced the lido to close its doors. The building went on to play a vital role in the Second World War; in 1941, it was requisitioned by the National Fire Service – who also requisitioned the lido’s sister building, the Ocean Hotel. The lido was used as a water tank, and the grounds were used by instructors and fire officers for training exercises. It was during this period that the lido’s iconic neon-lit art deco sign was taken down and lost. Although the pool was closed to the general public at this time, an alternative role was found for its changing rooms. Sister McLaughlin, from Kemptown, Brighton, petitioned the council to have the Lido’s wings sanctified for religious use. Its male changing rooms were used for church services and the female changing rooms became a Sunday School. After church services ceased, the Saltdean Estate Company viewed the damaged lido as a casualty of war, and it was mothballed. The site became an ‘unofficial’ playground for local children who would take buckets and nets, and look for newts in its weed ridden pool. The once iconic ‘beacon of modernism’, lay derelict for decades. It is even said that when Her Majesty, Queen Elizabeth II, drove past the historic site in her motorcade – as part of the coronation tours of 1952 – she pointed at the crumbling site in surprise. In 1952 an entrepreneur called Billy Butlin arrived at Saltdean and took a keen interest in the town’s potential as a resort. Butlin had decided to add a string of hotels to his holiday empire, and The Ocean Hotel was his first and grandest. In the 1950s, cocooned in barbed wire, the future of Saltdean Lido was in doubt. Several schemes were put forward and rejected. Billy Butlin even tried his hand at acquiring the site. He wished to build an American style roadhouse over the pool which would have included a restaurant, indoor pool and bowling rink. Brighton’s Planning Committee rejected it as being ‘out of character with the neighbourhood’. Thankfully, in July 1964, due to mounting pressure from the community, the Lido was re-opened. This time it benefited from a complete restoration by the Brighton Council, who also extended the building with a new community centre and library. The lido was once again the hub of a bustling holiday resort, and used by tourists and residents for decades to come. However, after a 30 year period of uninterrupted swimming and leisure, the pool closed once again. This time, it was due to mounting maintenance costs. In 1997 it was believed an answer had been found when a group of businessmen took on the site and made remedial repairs. However, the leaseholder then revealed plans to close the pool forever. The Save Saltdean Lido Campaign was set up in March 2010 by local residents after plans were announced to fill in the swimming pool, develop the site extensively and create 125 apartments. In March 2011 an application from the Save Saltdean Lido Campaign to English Heritage to upgrade the building’s status to Grade II* was successful. It is now the only Grade II* Listed coastal lido in the country. Later the same year the lido was added to the English Heritage ‘Buildings at Risk’ Register. The lido lease was returned to Brighton & Hove City Council (BHCC) in May 2012 at which point the council began developing a plan to secure the long-term future of the site. In October 2012, with the lido safe from residential development, the Saltdean Lido CIC (the CIC) was set up with the core objective to provide a sustainable future for Saltdean Lido. The CIC’s mission is to safeguard and restore Saltdean Lido for the benefit of the city and future generations to come. In December 2013 BHCC announced that the CIC had won the tender to take on a 63 year lease of the site. Phase one of the project – the restoration of the original 40m pool tank, and grounds - is near completion with the pool scheduled to open in May 2017. Phase two – the restoration of the lido’s iconic 1938 building – requires further funding but, once complete, will include a heritage café – which will tell the story of the lido’s history, celebrating Saltdean Lido’s unique heritage and it’s story within the golden age of the lido movement. Both documents have been written by Jeremy Lake in collaboration with Deryck Chester of the SLCIC. 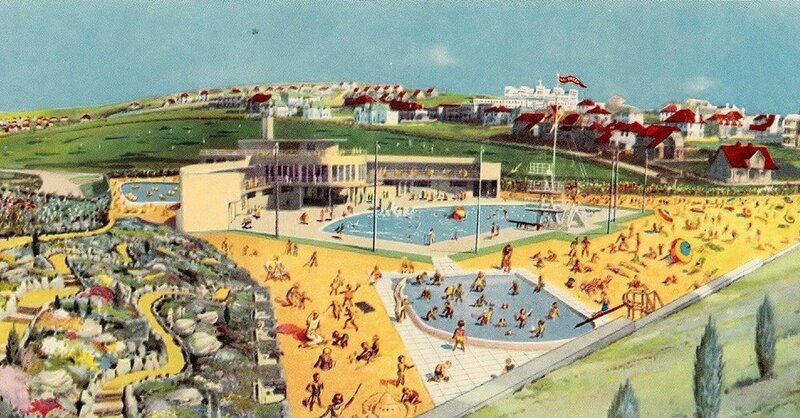 Circa 1940, depicting the sister attractions, The Ocean Hotel and Saltdean Lido. Both buildings opened in 1938, and are considered to be two of the finest examples of modernist architecture in the UK. Circa 1964, when Saltdean Lido re-opened its doors after a restoration by Brighton County Council. The reinvented lido provided the perfect playground for holidaymakers and thrill seekers during the swinging 60s, and decades to come. 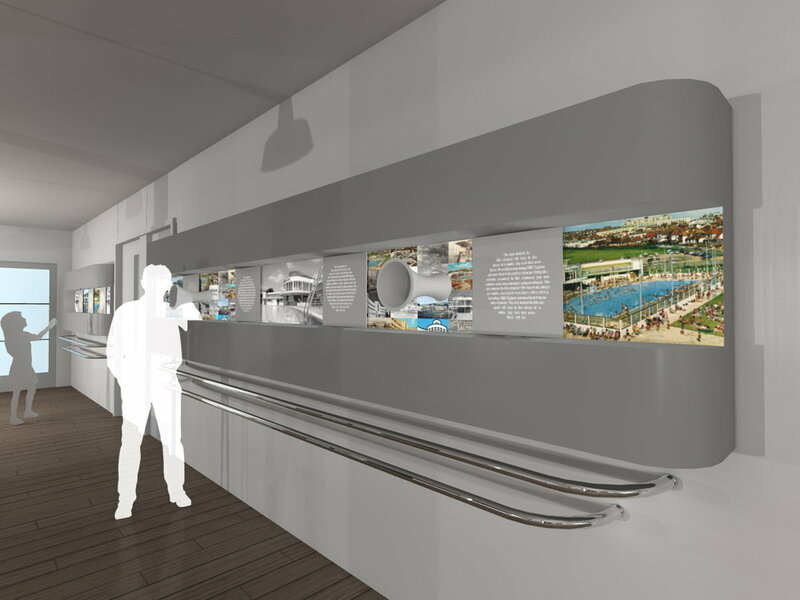 The restored lido building will feature interactive heritage interpretation panels, so that future generations can learn about: the lido movement, modernist architecture in the UK, and Saltdean's role in the heyday of the seaside holiday.